The Miles Bellhouse and his Curious Machine slot machine is one of the best and most beautiful ever created. 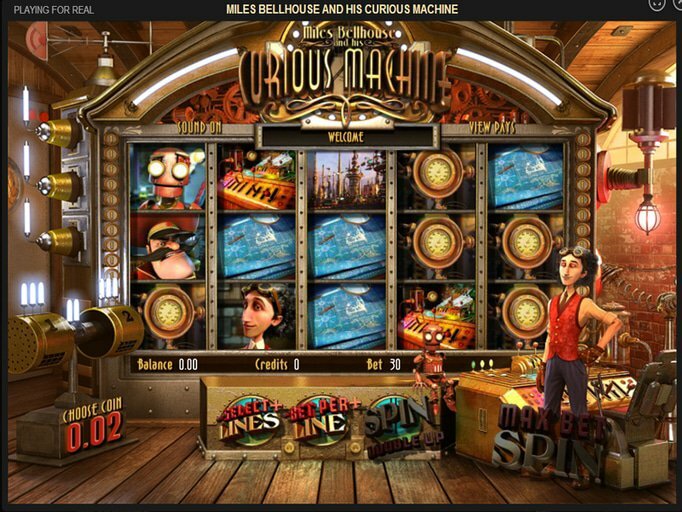 Featuring Miles as an inventor and all the tools of his trade - including his arch nemesis - on the five reels and 30 paylines, you'll quickly find yourself rooting for Miles and hoping that his inventions work! There is a top jackpot of 12,500 coins and since coin denominations start at just $0.02 and climb to $1, you can win anywhere from $250 to $12,500 in a single spin. As soon as you've set up your per-spin bet using the buttons at the bottom of the screen (or you can simply click Bet Max rather than Spin), you can get started. There are some pretty fantastic features here to note which include the Vortex which acts as your wild. It will substitute for any regular icon and it will also "swirl" the others nearby around on the screen to line them up in a different way. This way, you'll be able to create tons of awesome left-to-right combos. Next is the Second Chance Reel that activates any time you fail to win a prize. Though it will rewind one of the five reels, you will need to have all 30 paylines active in order to use it. Then, there's the Dinosaur which will trigger free spins whenever three or more of them appear. What's more, all of the prizes won can be associated with a multiplier ranging from 1x to 5x at random! Finally, there is the Control Panel which triggers the Time Travel bonus when three or more appear. You'll get to visit different eras while being awarded instant cash prizes. If you're interested in seeing this inventor create interesting things, then head over to Tropezia Palace Casino where you'll get some Miles Bellhouse and his Curious Machine free spins to start you out. You aren't obligated to make a deposit when these are gone, but if you choose to do so, you'll get a 200% match worth up to $200 to help you boost your bankroll right from the start.